I had fun making decisions about everything else I could think of this week! This has taken a month for me to decide. Can anyone relate to my little binge before the purge. natural fiber rug, cozy cotton rug?? White towels, Cream towels, Pattern towels, Monogram towels?? Swing arm lamps, clean and simple or a little detail? Notice the Roman Shade...new and improved folds ...done! Gave the trim a fresh coat of paint. this super shiny 90's look! The caulking has to be removed or you don't get a nice clean paint line. If you don't want to disassemble the shower, this is the deal. Go see what my fabulous friends have been up to this week! Can't wait to see the end results of this!!! You are so brave to paint that. You know I would paint almost anything, but you are upping the ante on that baby. Good luck. Yes, I take home the store and then return most of it. Wow, I didn't know you could paint that! Can't wait to see! Looks good..looking forward to seeing the big result! Oh my gosh - that is a big DIY but I know you can tackle it! Everything looks so great - the shade, swing arm lamps, all the accessories to choose from! Can't wait for the big reveal!! Everything will come together beautifully! all those yummy textures and choices! I know what you mean! You just have to try them all and it hopefully will "speak" to you! You have great taste so I know it will be fabulous. Good luck with the shower door painting--you can do it, I know you can! oooh looks like a lot of work, but it will be worth it! and i am a fan of the soft cozy shaggy rugs for bathrooms! love the grays! Cannot wait to see what this looks like Love the pattern mix you are using. This is going to look incredible! Oh, I'm so glad you're tackling this. I have a feeling I'm going to need the tutorial one day. Here's to hoping it goes/went smoothly! 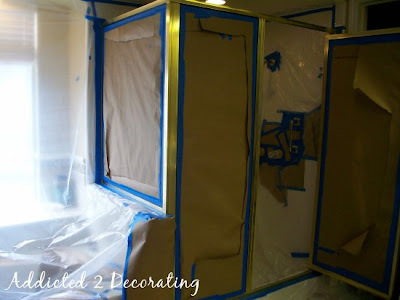 Can't wait to see that shower door makeover! Choices, oh the choices. They stall me every time! OOOh there is lots still going on in there...anxious to see what you pull together! How exciting to have a piece from Kerry! Love the chevron patterned rug at top. Could you give the source? You can paint faucets?? Learn something new every day! My parents bathroom growing up was that lovely pink fifties tile that had a black tile trim. My mom painted out all the black with a metallic gold-also had no idea you could do that, but she did. Of course, this is the same mom that took a sledgehammer to a wall because my dad was a little slow on getting some work done!! You are one ambitious lady - why don't you come help me with some of my house projects I keep putting off? Pretty please??! Oh you know I relate to the binge and purge- unable to decide until I see it in the room. I love all of the options. You are so ambitious- the prep work looks like quite a chore but I'm sure it will be worth it. Good luck! So many choices. Can't wait to see it all done! Anonymous ~ the chevron rug is from West Elm. Can't wait to see the bathroom makeover next week! Good luck! Wow - you are busy...and so many choices! Can't wait to see next week! I can't wait to see how your shower turns out. I have the same 90's gold and have been debating about whether to change it or not since brass is coming back in a big way. What product are you using to paint it? I would love to find a good brushed gold look that's a little more subtle than the bright shiny gold of the 90's! Only one more week! I think everything is looking fabulous. Fingers crossed the shower turns out just as you want it to. Wow...decisions, decisions! I can't wait for next Wednesday. Wow are you ambitious! All of that tape makes me tired just looking at it but I am sure this is going to be one drop-dead space. I think it's going to look great! Good luck-I can't wait to see it! Seriously? That is an ambitious project, Pam! Good luck getting it all done - sure I will love it - I love everything you do! Oh I agree...so many decisions. What an undertaking to paint the shower surround. You're doing great! Wow, you have been one busy gal! Loving it! Can't wait to see how the paint technique turns out!! You are painting a shower surround? I can't imagine? How do you paint the facets and trim work around the stall? You amaze me! Oh, the suspense!!! Can't wait til next week. OH MY. You are truly an ambitious lady! I can't wait to see it! You have quite the DIY! Wishing you all the best! Can't wait to see it. Wow Pam! So many decisions .. it's all coming together and I can't wait to see the end result! Girl, you are one brave mama! Cant wait to see what you will be doing next..
Wow, so many decisions. I can't wait to see how your shower surround comes out. You just can't be stopped! Go girl! I will wait anxiously to see how yours turns out and them maybe I'll finally tackle it. Decisions, decisions! You are so talented ~ I know it's going to be gorgeous when you finish. Can't wait to see the shower surround in its new style. I am with Luci, that's our exact same shower surround. I have changed the little things, but would love to see how this turns out! How amazing! I also love the trim added to the sconce shade. I know this room will be fabulous! It cracks me up whenever I encounter a client who thinks there are no design decisions in a small bathroom. I think this post proves otherwise! Looking fantastic. I Love that patterned rug. Prob not with your shades, but it sure is pretty. Well, I have to admit..I thought it was your powder room as we were only seeing the sink area as a sneak peek...i must have missed something..somewhere!....I know I get myself in a total "design paralysis" when I have too many choices...I know that you will chose the perfect things...your taste is impeccable...and good luck on the painting of the shiny brass...looks like a lot of work!! Oh my, you're tackling the surround and faucets with paint? I've always been afraid to do that. You're getting to the fun part with all of the finishing touches. Can't wait!